"The real role of microcredit lies in unleashing the entrepreneurial energy of the poor, a source of energy that, if properly harnessed, can uplift an economy at large along with the direct benefits that accrue to the poor." Iqbal Quadir was selected by the World Economic Forum as one of its choice for Global Leaders for Tomorrow – a club of young people chosen for their commitment to social issues. An Investment Banker by profession, Iqbal was the genius behind providing digital connectivity to rural Bangladesh – through his project GrameenPhone or ‘Village Phone’. He empowered ‘one woman in one village’ with a mobile phone, thereby providing her with a tool to earn money by letting others in the village use the phone and pay for its usage. In telecommunication-impoverished rural areas of rural South Asia, villagers normally travel to the nearest available phone, usually in the nearest town, to make a call. "I concluded that the general lack of other infrastructures was the main impediment to bringing connectivity to Bangladesh, especially to its rural areas. There were not enough roads to send repairmen, not enough records for credit checks on customers, not enough access points for potential subscribers or not enough banks for collecting bills. One bright spot in this gloomy situation was the Grameen Bank." Iqbal approached Mohammad Yunus, the grand man of microcredit rural lending, and together with a Norwegian Telecom company, they set up GrameenPhone. The phone owners, mostly women, make about $2.50 a day – still a high figure when compared to the national daily per-capita income. Apart from providing connectivity to families and friends, the availablity of a village phone has also improved local productivity by connecting them to whatever businesses they are involved in. GrameenPhone has already reached several thousand villages in Bangladesh – but it is still a long road to reach the goal of providing connectivity to 50,000 villages. The greatest contribution of Iqbal Quadir , however, lies in pointing the way to other developing societies, which are already following his model. "I owe my being to South Africa,... the country that did not allow me to go to film school because that was a school for whites only; a country that did not allow me to watch a film that I produced with the director who was white because cinemas were segregated." 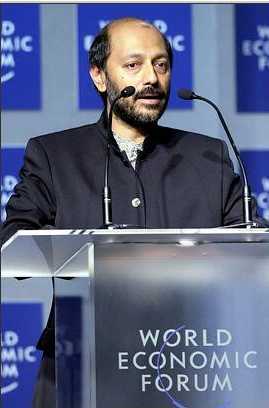 The World Economic Forum presented its annual Crystal Award for cultural contact through artistic expression to South African film-maker Anant Singh, and three others. The Crystal Award, said World Economic Forum Founder and President Klaus Schwab, "recognizes the hope and understanding that comes form the exchange of ideas, be they in the form of music, film, painting, literature or other modes of expression. The 2001 awards were given in the spirit of the theme of the Annual Meeting: Bridging the Divides. Singh is best known for his films Cry, the Beloved Country and Countdown to Freedom. He is currently working on a film based on Nelson Mandela's autobiography. The film will be directed by Shekhar Kapur. Anant's 45 films and documentaries brought him South Africa's first membership in the Academy of Motion Picture Arts and Sciences and an Oscar nomination. Before conferring the Crystal Award on Singh, Schwab screened a short message of congratulations from Mandela. Singh gave tribute to his homeland. "I owe my being to South Africa," he said, "the country that did not allow me to go to film school because that was a school for whites only; a country that did not allow me to watch a film that I produced with the director who was white because cinemas were segregated."